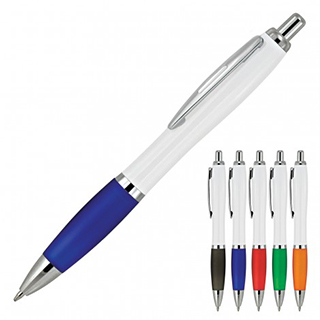 With push button, retractable ballpoint, the Cara White Ballpoint Pen is a classic and stylish quality option for your next promotion. The plastic barrel can be pad printed with logo branding to create a classy corporate gift. Black ink - plastic Parker type refill (1.0mm nib, 1,000m capacity). Colour: White/charcoal, white/blue, white/red, white/green or white/orange.